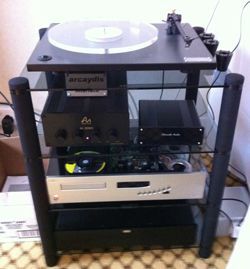 BRISTOL SHOW 2012: Nine new products from Talk, Saxon and Edwards Audio | What Hi-Fi? Talk Electronics, Saxon and Edwards Audio have no fewer than nine new products on show here at Bristol. They're all exhibiting together, along with speaker specialist Arcaydis. 1. Saxon P720 200W stereo digital power amp £1200 (see right, bottom of hi-fi rack). This will be joined in due course with a preamp and multichannel power amp. 2. Edwards Audio MC2 MM/MC phono stage with two sets of RCA inputs, mono mode and separate, dedicated power supply. £1000 for the pair. 3. Edwards Audio Apprentice entry-level turntable (pictured below) at £299, which is based on the Rega RP1 but uses a new belt, oil and has an optional matching MM phono stage (£89.95). 4. Edwards Audio TT2 turntable with upgraded arm, new counterweight, ceramic bearing, a new belt, aluminium inner hub with stainless steel spindle. £599. (See top picture, on top of the hi-fi rack). 5. Edwards Audio IS1 isolation power supply for turntables and DACs. £199. 6. Edwards Audio SP1 bookshelf speaker in light oak, £549. Available from April. There'll be a gloss black version later. 7. Edwards Audio Apprentice 1A 50W stereo amplifier, £495, available April (above left). 8. Edwards Audio HA1 headphone amp with 3.5mm and RCA inputs £279 (above right). 9. Talk Cyclone 2 70W stereo amp £899, available April.